Miniature Japanese maples, also called bonsai Japanese maple trees, have the same characteristics of full-sized Japanese maples, only they are smaller in size. These trees do not naturally exist, but their growth and development is artificially stunted by constant pruning, wiring and clipping, and they are usually potted. 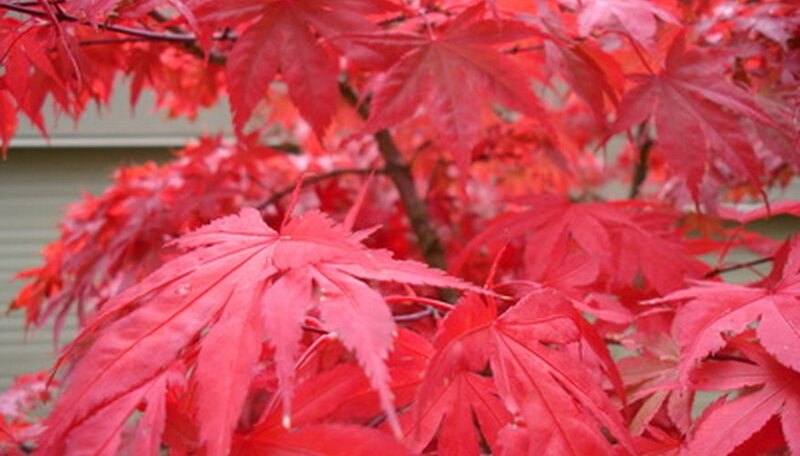 Japanese maple (Acer palmatum) is also called smooth Japanese maple. In Japan, these trees are sometimes called momiji, meaning "crimson leaves," due to the color of foliage, and "baby's hands," because of the usual shape of leaves. Renowned for their beautiful foliage color and shape, different types of Japanese maple trees grow in forests across China, Japan and Korea. Depending on the cultivar of the tree, they range in height from 10 feet to 40 feet tall, with leaves that are broad or lacy, and green, red or variegated. Some types feature drooping or bowed branches. While some types prefer sunlight, other like shade. Almost all types of Japanese maples are ideal for miniature growth because of their slow growth habits and attractive leaves. Miniature Japanese maples are different from dwarf Japanese maples that are specifically bred in nurseries to grow up to a certain short height and spread. Most dwarf varieties grow to 8 to 10 feet in height, which is why they resemble shrubs when grown in a landscape or container. Miniature Japanese trees, unlike dwarf varieties, are miniature versions of the full-sized tree. These trees would reach their full height if allowed to grow naturally in the garden or wild. The branches and stems are pruned frequently to maintain the miniature size. Miniature Japanese maples are deciduous trees, which means they lose their foliage and become bare every winter, unlike evergreens. These trees thrive in USDA hardiness zones 5 to 8 and prefer a partially shaded spot with well-drained loam or sandy soil that is evenly moist. The ideal pH value of the tree differs according to the cultivar, but lies between 4.0 to 6.5. Spread an even layer of mulch over the base to keep roots cool in the summer. Bonsai is an ancient Chinese art of artificially restricting plant growth. Many types of landscape trees can be trained to grow an bonsai, including juniper, pine and Japanese maples. The roots and leaves of the particular tree are pruned frequently to stunt growth, and the stems and branches are wired in the desired shape. There are several styles in which the miniature Japanese maple is trained as bonsai--the informal style features a single trunk that wanders slightly, the formal style features a single, upright and erect trunk, and the cascading style trails downward. Fill a decorative pot with good quality potting soil. Lift the Japanese maple and trim its tap root as close to the base as possible to restrict vertical growth. Place the pot in a partially shaded outdoor spot, and mist frequently to increase humidity. Re-pot every two years to a larger pot and prune periodically.